If you are a Formula one fan and happen to be in Budapest in the middle of the summer, you shouldn’t miss the F1 Hungarian Grand Prix between 02 – 04. August 2019. The main race takes place on 04. Aug, Sunday but qualifying runs will be held on the two previous days. You can also take a Public Pit Walk with a valid F1 race ticket on 02. Aug, Friday between 16.00 and 19.00. The F1 Grand Prix is held at Mogyoród town, 20 km northeast of Budapest. The racetrack is in a valley, surrounded by a beautiful hillside, so you can enjoy much of the race from any point. You can also follow the race on several well-positioned giant TV screens. This season has been quite interesting so far, and the Hungarian circuit surely won’t be boring either. Though drivers often criticize the track, because it’s narrow and there are few points where they can overtake each other. After Monaco, the Hungarian F1 race has the slowest average speed. But you can never foretell who’s going to win the Hungarian Grand Prix, that’s why F1 fans like this circuit. The race is held in the hottest part of summer, which makes concentrating on the track for 2 hours rather demanding for the drivers. Three Corner – lets you see the race from three different Grandstand spots during the weekend (costs 130- 260 EUR, ). General admission: whole weekend: adult 90 EUR, junior: 45 EUR, Sunday only: adult: 80 EUR, junior: 40 EUR. Tickets can be purchased online until 02. Aug then only at the ticket office on the spot. The General Admission for Sunday is 90 EUR/adult/45 EUR junior. Weekend tickets are valid for all 3 race days. With a weekend ticket you can visit the boxes on Thursday between 4 pm and 7 pm. If you’re lucky you might even bump into one of your favourite drivers. 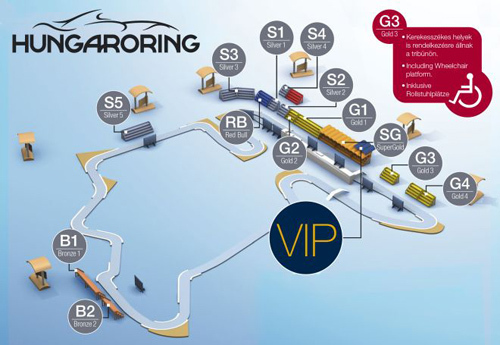 All tickets include free parking in the Hungaroring’s parking lots. Prices vary within these categories from 45 EUR to 450 EUR. The new Three Corner, Super Gold, Gold, and Silver tickets are for the grandstands. The most expensive ticket (VIP Tribune-Weekend) costs 450 EUR (for this price you get the best view of the start and the finish, there are also giant LED TV walls opposite the grandstands where you can follow the race). All Gold tickets are for the grandstand, opposite which is a giant TV screen to follow the race on. Super Gold – the best view can be enjoyed from any of the 7 600 seats, it is the only grand stand with cover (comes good on sunny August days). Gold 1, – you can perfectly see the top pits as well as the start and the finish of the race. Gold 4 – it is located at the home stretch, right across the first turn, and you can see the start, the finish, and several turns. Gold 5 ticket – located between the Super Gold grandstand and Gold 4 grandstand: you can see the pit exit and the first turn, the most popular spot at overtaking on the Mogyoród race track. Silver 3 – at the last bend just before the home stretch, you can see the start/finish and the previous two turns. Silver 4 – on a hill above the Gold 3 and Silver 5, – a great view of the whole race. In case it’s hot (and it usually is in Hungary in August), bring your sunglasses, sunscreen, and a baseball hat. Don’t forget your umbrella either; summer showers are not unusual during summer. You’d better bring some refreshments (mineral water, sandwiches) and snacks as well, unless you don’t mind buying them at a much higher price from vendors on the spot. TIP: There is an Auchan supermarket nearby Hungaroring, you can get these things there much cheaper than inside. How to get to the Formula 1 Race in Mogyoród? If you don’t want to rent a car and drive, you can take the suburban railway from Örs vezér Square. Get off at Szilasliget stop (it takes about 30 minutes to get there). Although there is also a Hungaroring stop, but from there you have to walk on dusty dirt road, while from Szilasliget there is a pavement to the racecourse. You can get ticket for the HÉV at the ticket office on Örs vezér Square. See schedule for the Suburban Railway H8 line. The organizer of the Hungarian Grand Prix provides buses for free for those who have valid GP tickets. Buses depart from the Pest end of the Árpád Bridge (Volánbusz coach station, close to the M3 metro stop) , and take visitors to the centre of Mogyoród (Templom tér). From there the race track is about a 40-minute walk. Friday, Jul 26., 2019. – Buses depart every 15-20 minutes between 7:30 and 11:00 to Mogyoród, every 30 minutes between 11:00 and 16:00 both directions and every 15-20 minutes between 16:00 and 19:00 from Mogyoród. Saturday, Jul 27., 2019. – Buses depart every 6-8 minutes between 7:30 and 11:00 to Mogyoród, every 30 minutes between 11:00 and 16:00 both directions and every 6-7 minutes between 16:00 and 19.00 from Mogyoród. Sunday, Jul 28., 2019. – Buses depart every 6-8 minutes between 7:30 and 12:00 to Mogyoród, every 30 minutes between 12:00 and 16:00 both directions and every 6-7 minutes between 15:30 and 17:30 from Mogyoród. You can get to Mogyoród in 20 minutes on the M3 motorway, Hungaroring is well signposted. You have to buy a pass (vignette) before driving onto the motorway. The weekly vignette costs 2 975 HUF, about 10 EUR. You can get it at petrol stations. Nevertheless, count on traffic jams before and after the race. If you don’t like driving, or waiting in the traffic jam that will surely occur before and after the race, use one of the official taxi companies that will drive you to Hungaroring for a flat rate of: 9.900 HUF (39 EUR). Find the lowest rates for Budapest hotels using the search tool on the right. The results will appear in a new window allowing you to compare hotel prices provided by 30+ booking sites. You can also read hotel reviews provided by travelers. 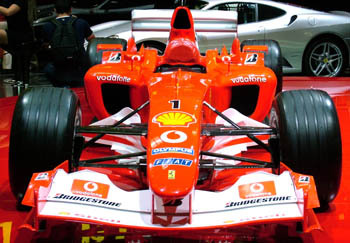 Book your hotel room well in advance for the F1 Grand Prix because August is tourist peak season and apart from the race many visitors come to Budapest for holiday. See our guide to Budapest Hotels. If you want to be pampered when you’re not at the race track in Mogyoród, a Luxury Budapest Hotel or a Spa and Wellness Hotel is the best choice. Consider renting an apartment if you find that all hotels are booked up, though many holiday lettings in the popular downtown districts of Budapest are rented out for July – August. See also our pages about Budapest Apartment Rental, guide to Cheap Apartments, and luxury apartments for rent.